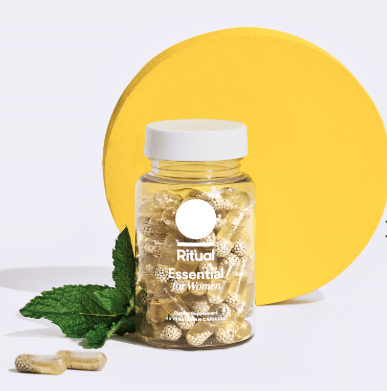 Ritual Vitamins Review – Is This Vitamin Subscription Worth It? Curious about women’s multivitamins? Check out our Ritual Vitamins review to learn all about their unique vitamins subscription! Discover lovely subscription boxes for women to pair with Ritual Vitamins – including beauty, skincare, jewelry, clothing, and even more! It can be hard to keep up with all the nutrients and vitamins you need if you’re devoted to a healthy lifestyle. There are so many! If you struggle with this too, vitamin supplements might come in handy. When I heard about Ritual Vitamins—a subscription-based multivitamin provider—I had to check them out. They’re pretty different from most of the subscription boxes I subscribe to, so I was intrigued. They provide monthly supplies of women’s multivitamins, which you’ll learn more about in this Ritual Vitamins review. There are currently two types: regular vitamins and prenatal vitamins. This article shares everything you’ll need to know about the subscription—cost, supplement facts, ingredients, how to save money on your first bottle, and more. In addition, I unbox my first shipment of Ritual multivitamins and share my experiences with it so far! Since I’ve seen various undetailed and often sponsored posts about their products, I decided to create this Ritual Vitamins honest review. To start off, the Ritual Vitamins website is simplistic and looks nice. They include everything you need to know—what the pills look like, what nutrients they provide, how much it all costs, why they created their vitamins, and so on. They even share where they source each of the nutrients in their multivitamin! In addition, there are a few customer reviews on their website. These are from health experts all the way to regular customers. Reviews aren’t limited to their website—there are Ritual Vitamins Amazon reviews, blog reviews, and more. You’ll find plenty of information and customer impressions all over the web. They also have a blog that has a variety of interesting, health-related articles. If you’re unsure why certain nutrients are good for you, they’ll definitely have an article about it. As I mentioned earlier, I noticed a few sponsored posts, so I wasn’t sure how legit the reviews on their website are either. I searched up a Ritual Vitamins review on Reddit because of this, hoping to find some reviews that I knew would be honest. There were a few critics, as expected, but the overall reviews were pretty good! In fact, many people said they saw improvements such as more energy, clearer skin, and so on. The only thing I couldn’t find on their website is a Ritual Vitamins free trial or coupon code, something that many subscriptions typically offer (and which I discovered after further research—you can find details a few paragraphs below). Like their website design, the subscription is very simple as well. 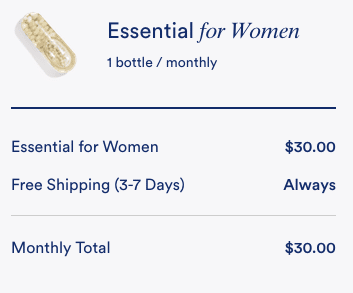 For $30 a month, you’ll receive a 30-day supply of the essential multivitamin. The prenatal costs $35 (although we’re focusing on the regular vitamins right now, we may have a Ritual prenatal vitamins review in the future). The regular multivitamin has nine nutrients and the prenatal has twelve. The subscription automatically renews and ships around the same time each month to ensure you don’t run out. It’s also easy to change the date your pills ship, skip a month, or cancel your subscription whenever needed. Nearly every subscription offers coupons, so I searched intently to find one for these vitamins. Thankfully, I found a Ritual Vitamins promo code for $5 off your first bottle! You can only get this by using someone’s referral code or signing up through their link, which is why it was difficult to find. I wasn’t sure how to find the code, but signing up through my Ritual link will get you $5 off! As for pricing, it might seem a bit pricey at first, but the $30 per month price is actually a pretty good deal considering what you get. If you purchased a monthly supply of each ingredient separately, it would cost $200! The Omega-3s would cost $25 for a month’s supply alone. Not only that, but the ingredients they use are high-quality, and they’re very cautious about sourcing them. One thing I loved about Ritual Vitamins is their devotion to healthy ingredients. There are no colorants, synthetic fillers, or extra ingredients—only the necessities. Each batch of their vitamins is tested by a third-party lab for any contaminants. Plus, their vitamin recipes were guided by scientists and nutritionists. The Ritual vitamin ingredients include nine different nutrients for the essential vitamin: Boron, Folate, Iron, Magnesium, Omega-3, Vitamin B12, Vitamin D3, Vitamin E, and Vitamin K2. A few of these are especially beneficial for diets that don’t allow you to get enough of certain nutrients. For example, it’s very difficult for plant-based diets to get vitamin B12, so a supplement or fortified food is necessary. In addition, the Ritual Vitamins prenatal includes 12 ingredients rather than 9! However, it’s $35 per month rather than $30. In addition to the previous nutrients, it includes Choline, Iodine, and Biotin. If you’re lacking any nutrients that these vitamins include, you’re very likely to see improvements. These commonly include energy boosts, clearer skin, and happier moods. This won’t happen for everybody though. However, many Ritual Vitamins customer reviews share that they encountered some, or all, of these positive effects. I know I’ve been slacking on vitamin B12, and possibly more, so I’m hoping to see similar improvements. If you’re someone who tends to experience side effects when taking pills (the most common one being nausea), Ritual might prove to be different for you! I looked for any Ritual Vitamins side effects on their website and in customer reviews, but I didn’t find any. 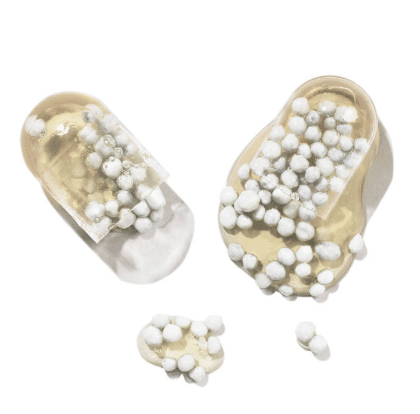 Their pill is designed to be gentle on an empty stomach because the release of nutrients is delayed, which is great for people who regularly experience nausea when they take pills on an empty stomach. This way, you’ll never have to worry about remembering to take your vitamins with a meal. With any popular company like Ritual, there will be a few complaints—and this is especially true when it comes to the vitamin industry. For one, vitamins aren’t regulated well as other edible products are, which worries many people. That being said, the only complaints I’ve discovered are from critics who don’t believe in vitamins or supplements altogether. For example, one Ritual multivitamin review stated that there are no benefits to these vitamins and it’s just a marketing scam. This extends much further than Ritual, though, because some believe there’s no real benefit to multivitamins at all. However, there is evidence that certain vitamin supplements work.